Alzheimer’s and its age-related maladies are increasingly taking center stage in the national health debate. This disease is not new, but the manner in which it has struck seniors in the 21st century is reaching plague-like proportions. The reasons are many and usually interconnected. Aside from a predisposition towards Alzheimer’s, the greatest cause for its spread is the success of modern medicine, which keeps people healthier, and helps people reach a more advanced age than ever before. The main cause for the preponderance of Alzheimer’s, and many forms of dementia today is the demographic growth of society as a whole. This means that healthcare specialists and caregivers are invariably coming into contact with sufferers of the disease. One of the most common tasks they will eventually have to perform is bathing. This mundane but essential task can present an added challenge for patients and caregivers alike. Patients with Alzheimer’s are at risk of falling and being injured when bathing or taking a shower. This is why a caregiver must assist in this essential task to ensure security. The difficulty lies in the patient’s confusion and anxiety in a situation that they may not fully understand. Also, as the disease progresses, the senses rebel against the patients and provide further confusion and sources of conflict. The water jet spraying from the faucet can be seen as threatening, causing fear and alarm, accompanied by aggression from a fearful and confused patient. Seeing a reflection in a mirror can also be a source of confusion. This makes the bathing experience disagreeable at the least for Alzheimer’s patients, putting a great deal of pressure on caregivers to find increasingly creative ways to calm and manage their charges. Some strategies can help families and caregivers limit the stress Alzheimer’s patients feel when bathing. Right Timing: The caregiver must take the time to study their client and choose the right time of day for bathing. At different times of the day, Alzheimer’s patients will be calmer and more lucid, potentially making these good times for bathing. Preparation: The caregiver should prep the bathroom beforehand, gathering all necessary items to have them close at hand. Leaving a patient in the bath while looking for a bar of soap may not only be frightening for them but also a security risk. It is also important to ensure that water temperature is not too hot or cold for the patient. A patient may not be able to communicate this, engendering stress and anxiety. Independence: Caregivers should take the time to analyze their clients’ capabilities. They should allow and encourage them to do as much as possible on their own. This will not only improve the patient’s motor skills but is also less stressful than having the caregiver touch them. Self-Awareness: People who have dementia are very sensitive to the people around them. They are very likely to detect whether or not the caregiver is apprehensive and will mirror the feeling. Caregivers must take charge of their emotionsat this particularly sensitive time. Negotiate: It’s a good idea to take a Pavlovian approach to dementia patients. A caregiver can opt for a reward strategy when trying to obtain cooperation, such as the offer of a drink right after the bath or watching a particular TV show. The idea is to influence rather than force cooperation. Flexibility: Caregivers shouldn’t be afraid to reassess the situation and readapt their approach accordingly. If the patient refuses to cooperate, you can opt for a sponge bath. 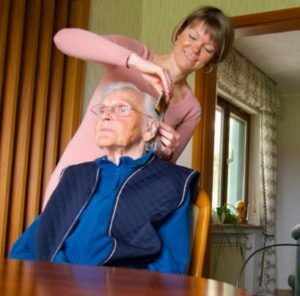 Bathing and grooming persons who have Alzheimer’s and dementia will always demand a flexible approach and there is likely to be a steep learning curve. The main thing is to be observant and to actively listen to them. By taking an open and empathic approach to these patients, caregivers can provide essential services with a minimum of stress to their clients.